Twenty years ago I was just getting into basketball. I had hand-me-down Charlotte Hornet everything: jerseys, shorts, caps (still got one), tracksuits, t-shirts, everything. I was heavily into NBA Jam and was dominating my friends (still can) with the Hornets tag-team of Alonzo Mourning and Larry Johnson. Then Space Jam hit cinemas. Just in case I didn’t love the Hornets enough already, here we have a movie where aliens from outer space come to earth to steal the powers of two Hornets players in order to help them win a basketball game. Even though the aliens are painted as the bad guys in the movie, I was secretly backing the Monstars over the Toon Squad (not sure I should admit that…) because I wanted my Hornets to win. When you really break it down, they have a far superior warm-up song. Toon Squad has Pump Up The Jam by Technotronic, whereas the Monstars come out to Hit Em High by the all-star line up of B-Real, Busta Rhymes, Coolio, LL Cool J and Method Man. If you’re having a hard time believing me which song is better, just check the soundtrack – you will find the Monstar anthem, but no Technotronic. I was a bit young for hip-hop, but a picture of Bugs Bunny and Michael Jordan on an album cover can really help sway a parent’s decision to buy you a CD. Every time I shot hoops in the backyard on my 9-foot rim, I would recite the Space Jam soundtrack and try and dunk that basketball. The soundtrack to Space Jam is as good, if not better than the movie. R Kelly, Barry White, Seal, Salt ‘n’ Pepa, Monica, The Spin Doctors and Biz Markie, D’Angelo, Coolio, plus all the collaborative tracks makes this soundtrack one of the best CDs I own. It’s hard to actually say where my musical tastes originally stem from, although I often credit my best mate’s older brother for bringing hip-hop into my life. But, revisiting this gem has me thinking that Space Jam might have actually been my first glimpse into hip-hop. One of the best tracks is Basketball Jones by Barry White and Chris Rock, which appears a few times throughout the movie. My opinion on this track has changed over the years. The track works best while played during the film, and although I used to find Chris Rock’s bits funny, today, I find Chris Rock a hindrance on a what could be an amazing track in full. So sometimes I play the Cheech and Chong version instead. The one song everyone knows is the Space Jam theme song by Quad City DJs. If Space Jam wasn’t considered a kids movie and therefore lame to pick, this song would have made it onto all my warm-up track requests throughout my basketball career. I have vivid memories of waiting for this song to play in the movie and slam dunking and subsequently breaking my mini basketball ring above the door. The soundtrack truly made me a savage in the paint. Listening to this album as an adult gives me a greater appreciation for just how amazing it is. D’Angelo is incredible. Jay-Z is on All Of My Days with R Kelly and Changing Faces. Not only that, but he actually wrote the rhymes for the Bugs Bunny track Buggin. What I am about to say next is going to sound corny as, but I used to listen to R Kelly’s I Believe I Can Fly and Seal’s Fly Like An Eagle and just dream I could dunk a proper 10-foot rim. Not just a classic European dunk either, but a proper windmill/360/the D Brown Dab. I was eventually able to do these dunks, but I never quite mastered the Michael Jordan stretch arm dunk (or many of Jordan’s insane dunks). Although I have been retired from basketball for nearly four years now, the songs in this soundtrack still have the same effect on my today. I just want to dunk the basketball every time I hear one of them. I have (successfully) slam dunked about 10 balled up clear-wrap into the dumpster outside and only have one small graze on my wrist, talk about ups. I wonder how far I would have gone in basketball had it not have been for the songs on the Space Jam soundtrack. It got me amped from a young age to fly and slam dunk. It is responsible for a lot of the type of music I still listen to today, and my parents almost encouraged it (unlike Blink 182’s Enema Of The State) as it was a kids movie and therefore a PG soundtrack. If you haven’t watched Space Jam – do it! 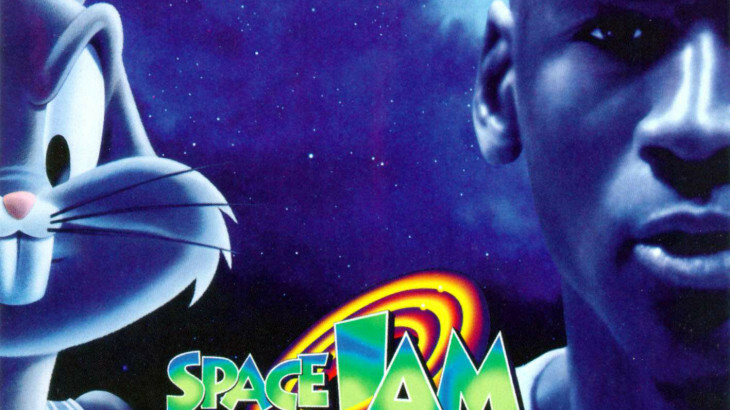 If you already love Space Jam, do yourself a favour and re-listen to this amazing soundtrack. Flashback Friday Space Jam. permalink.